« What Were You (for Halloween)? JANE: Last time you mentioned some uniquely New Zealand slang. 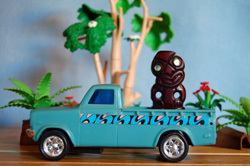 I’m particularly intrigued by “tiki tour” and “rattle your dags.” Where do they come from? ALAN: It’s not clear where the phrase “tiki tour” originated, but one possible explanation (which I’m rather fond of) is that shortly after the end of WWII, the New Zealand government was keen to attract tourists to the country. They felt that tourism could be a big money-spinner and who’s to say they were wrong? JANE: Uh… “Money-spinner”? I get it in context, but I can’t quite grasp the image. Could you clarify? How does spinning money produce more? ALAN: It’s an English phrase rather than specifically a New Zealand one, and it’s such second nature to me that your question actually took me by surprise. But when I thought about it, the first thing that sprang to mind was the fairy tale about the miller whose daughter could spin straw into gold. (Rumpelstiltskin saves the day!). The image of turning something almost worthless into something very precious is a powerful one, and even if the saying doesn’t derive directly from the fairy tale, it really should, because that’s exactly what it means. JANE: I really like that explanation. Thank you! Now, please, go on with tiki tours! ALAN: Right! So they organised some rather rambling bus tours of the country under the name Tiki Tours. A Tiki is a traditional Maori carving of a rather squat human figure and I suppose the government felt that it was a quintessentially New Zealand symbol. Of course, being a government-run initiative, it was hopelessly inefficient and never amounted to much. So the phrase entered the language and was used to denote something rambling and ultimately pointless. JANE: I love that! I think I may start using the term “taking a tiki tour” when I need to fill out various forms… How about “rattle your dags”? JANE: Australia is also known for sheepherding. Do they use the same term? JANE: “Dag” also sounds vaguely Scottish. Do you know if the term is another one influenced by the Scottish settlers? ALAN: I don’t think so. As is so often the case, the origin of the word is obscure. However the Oxford English Dictionary claims it comes from Late Middle English and may possibly be derived from “tag”. JANE: Here the phrase might be “What a wag!” This would have nothing to do with tails, either. The phrase is a bit old-fashioned, so I can’t even guess at why it was used. You’re married to an Australian. How did Robin react to your comment: “Most Australian things are much larger and more vicious than their New Zealand counterparts. Including Australians…”? Actually, one of the things that Robin complains about a lot is the extraordinarily large and complex way that Australia is governed. Their mechanisms are not inherently any more vicious than ours, but they are certainly significantly larger. Robin really likes the much simpler model that we follow in New Zealand – she’s worked in this area and she’s seen the advantages and disadvantages first hand. JANE: What are some of the differences? ALAN: Australia has a multi-layered system of government. At the top is the federal government which has two chambers, the Senate and the House of Representatives. The individual states are self-governing (and also have two debating chambers). There are local government organisations within the states as well. In addition, Australia recognises something they call a Territory which are areas within the country not claimed by a State. Territories can be administered by the government or they can be self-governing. How does New Zealand manage? ALAN: It’s dead simple. We have local government and national government. End of story. And our national government only has one assembly. We got rid of the second chamber about fifty years ago, and we’ve never missed it. JANE: I’m sure someone misses it. Probably the people who like to argue, rather than actually getting things done. ALAN: The simplicity of the New Zealand model means that responsibility and lines of demarcation are very clear and well defined. And the single national assembly means that law changes are relatively quick and easy to put into practice. In complete contrast to Australians, New Zealanders have the reputation of being keen to embrace both social and political change. In the thirty-five years that I’ve lived here I’ve seen many quite radical changes take place. JANE: I’d love to hear an example or two, especially those that reflect the differences in national character. ALAN: I could witter on about fiscal policy and similar dull subjects, but I think a good reflection of our national character is in the way we interact with our government. New Zealanders are very much in love with technology. Many governmental functions are now available on the web. I recently renewed my passport – it was quick, painless and easy. I didn’t even have to leave home. I filled in a form on a web site, attached a digital photograph of my face and clicked the submit button. A few days later my new passport arrived in my mailbox. Australians can’t do that – there are on-line forms that they can fill in, but the forms have to be printed out and presented in person at the passport office. We’ve completely eliminated that step. I applied for my pension on line and I recently claimed a tax refund on line. Literal paperwork is well on the way to disappearing over here. JANE: Nice, I suppose, although I can see how such procedures would make identity theft and related forgeries much easier. I also think that the make-up of our parliament reflects our national character very well indeed. Our MPs are a very heterogeneous and multiracial bunch (not just Maori and Pakeha). We have members from most of the major religions (as well as self-professed atheists). We have openly gay and transgender MPs and we currently have one who is completely deaf. I’m not sure what (if any) special arrangements have been made for her, but she is very active in debates and more than pulls her weight. None of this raises any eyebrows at all. But I simply can’t imagine any of it happening in Australia. JANE: Or, sadly, in many parts of the U.S. I have one friend who I think would make an excellent politician. I asked her why she didn’t run for office, and she said she felt her open atheism would make it pointless. How about a “social” example? ALAN: OK, here’s a good example. Unlike Australia, we’re almost a completely cashless society, and we’ve been that way for all of this century. I can’t remember the last time I wrote a cheque – indeed, a lot of places now have big signs up saying that they will not accept cheques. Even the smallest shops have EFTPOS terminals, so cash is almost never needed. JANE: We’re moving that way, too. I still use cash, but only in a few places. Mostly I use my credit card, then pay off the balance each month. This way I don’t pay interest charges, but I also don’t need to worry about my balance as I would with a debit card. ALAN: Exactly so. But we seem to have segued into discussing definitions of national characteristics. I have some thoughts about how we can pin that down. Do you want to talk about it next time? JANE: That sounds fascinating – and challenging. Let’s do it! This entry was posted on November 5, 2015 at 1:00 am and is filed under Thursday Tangents. You can follow any responses to this entry through the RSS 2.0 feed. You can leave a response, or trackback from your own site. Well, dimes are smaller than nickels or pennies in the US. What’s up with that? Didn’t the Aussies get rid of pennies some time ago anyway? Canada got rid of the penny too (eh?) a few years ago. Sadly the loose-change-ripping-a-hole-in-your-pocket benefits of losing the penny have far been outweighed by the shift from paper one and two dollar bills to coins. Sounds like Aus is still following much of the British colonial model for government, much like Canada, whereas New Zealand doesn’t feel similarly constrained. Much fuming and shouting about abolishing the Senate in Canada, but I’m not holding my breath. Don’t know about in Australia, but in the U.S., making it difficult to pass laws and change things was considered a feature of the Constitution, not a bug. The primary concern was how to keep the federal government confined to a few roles for which it was suited, while leaving most people and the states free to do things in a manner each thought best. (Nowadays, we’d say that they wanted to allow for “diversity”.) The final two amendments of the Bill of Rights were meant to ensure that the federal government would not get out of hand and start dictating to the states and the people. Needless to say, those two amendments have been ignored for many years now. On the subject of “dags”, I can attest that if large enough and dry enough they do indeed rattle when a sheep runs. The etymology is unclear, but there is a middle English word dagge which describes decorative scalloping or other decoration on the hem of a garment. It isn’t hard to speculate how that could be crudely extended to a “decoration” around the rear end of a sheep. As to why the occur more in New Zealand, it may well be related to the more lush/fast growing nature of grass in NZ. Fast lush spring grass growth can be a trigger for ovine diarrhea which in turn leads to dags. I spent my youth on a sheep farm – this all brings back images that I need to blot out again. Exactly. The coins were gold, silver and bronze. And copper has always been a relatively high-value metal, so the relative sizes of nickel, penny and dime do reflect the cost of the blanks. In Rome? IIRC they were 19.6″ x ~ 11″, made of bronze, weighed about 6.5kg and you inscribed the details of the transaction on the reverse.